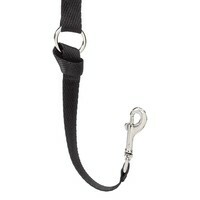 Halti Link Black attaches the Halti Headcollar to a conventional collar for added security. It has been made out of a strong nylon material that is both strong and durable, and double stitched for additional strength. The Halti Link also has a strong metal clasp and a solid metal ring that will attach to your existing headcollar and collar easily and securely.